In this occasion, we introduce you a new product of the growing disposable gloves family. It is the nitrile glove Aachen Fortis, as the rest of nitrile gloves, free of natural latex, suitable for natural latex´s alergic people. This material is very elastic, so it doesn´t add pressure to the hand and avoids the fatigue of the user. Its AQL is 1.0, what we remind, the quality is better when smaller is AQL number. This glove responds to a need that was primarily found in food industries and mechanical and automotive workshops. These sectors need the glove to be disposable, but also to have higher breaking resistance and tensile strenght. For example, disposable nitrile gloves intended for the health sector have a breaking resistance of around 6 Newtons (depending on the specific glove), and the Aachen Fortis one has twice the strength, 12 Newtons. 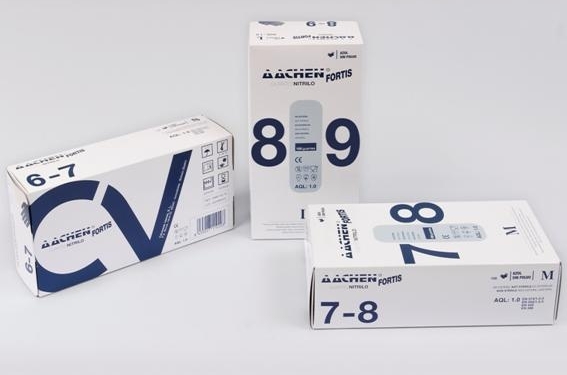 It is the same with the tensile strength, the Aachen Fortis one exceeds the breakage resistance of a disposable nitrile glove designed for healthcare use by around 35%. The use to which each type of glove will be given must be taken into account, and due to this, in CV Protection we continue making progress towards specialization for each work setting. In those aforementioned industries a glove must be able to be used for a full working day and must resist the mechanical stresses when working with tools, oils, petroleum derivatives, etc. This doesn’t happen in gloves intended for healthcare use, because they have a completely different set of requirements, as the maximum time a glove should be put on, that is 20 minutes, due to safety and hygiene reasons, and preference is given to the protection of both user and patient against chemical, biological and any type of micro-organism contagion risks. Due to its higher protection level, this glove also has the pertinent certifications for sanitary use, so, these gloves are used to protect both the patient and user against biological and chemical risks while medical examinations are being conducted and biological and analytic samples extracted, for chemotherapy drugs handling and medical equipment cleaning, when there is a long exposure to blood, body fluids or chemicals. Meets European standards EN 374/1-2-3 (chemical and biological protection gloves), EN 455/1-2-3 (gloves for sanitary use),EN 388 and EN 420. According to the description of the product, it´s light blue colored, with a special treatment in the inner surface to introduce the hand easily, without dust, to reduce the risk of having a dermatitis. The extern surface is smooth with a special texture in the end of the fingers to improve the grip. It also has anti-dripping and long rolled non-skid cuffs. It´s available in the sizes small (6-7), medium (7-8), large (8-9) and extra large (9-10). If you want more information from this product you can consult our website or contact us.